A succenturiate (accessory) lobe is a second or third placental lobe that is much smaller than the largest lobe. Unlike bipartite lobes, the smaller succenturiate lobe often has areas of infarction or atrophy. The risk factors associated are advanced maternal age, primigravida, proteinuria in the first trimester of pregnancy, and major malformations in the fetus. The membranes between the lobes in such placenta can be torn during delivery, and the extra lobe can be retained after rest of the placenta has been delivered, with consequent postpartum bleeding. 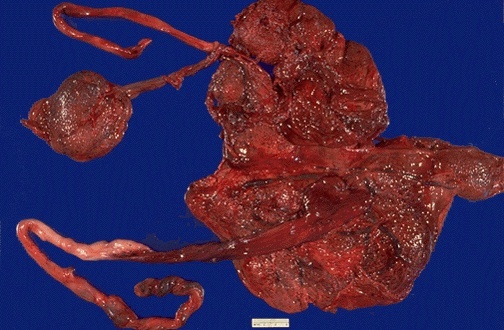 The picture above is a so-called "accessory lobe" or succenturiate lobe of placenta. This is a twin placenta. Such accessory lobes by themselves are of no major consequence unless large with tenuous blood supply, but they could produce problems at the time of delivery. Vasa previa results from a succenturiate placenta when fetal vessels joining the two lobes of the placenta are located between the baby's presenting part and the cervix or if the cord insertion is located between the two lobes (velamentous insertion of a bilobed placenta)."